I. Bohoslovska has never been an independent politician, she was always a “talking head” for oligarch Pinchuk. Her voice speaks for the Ukrainian oligarchy. They are building the state of their dreams, where they can loot and pillage while any dissenters are called “terrorists.” Our liberals openly rejoice, as the country goes direct route to 1970s Latin American-style dictatorships of neoliberal economy against the backdrop of military dictatorship. Towards Pinochet – the idol of neoliberal public. Today the oligarchy is experiencing a “golden age,” when participants of any protest can be declared terrorists. 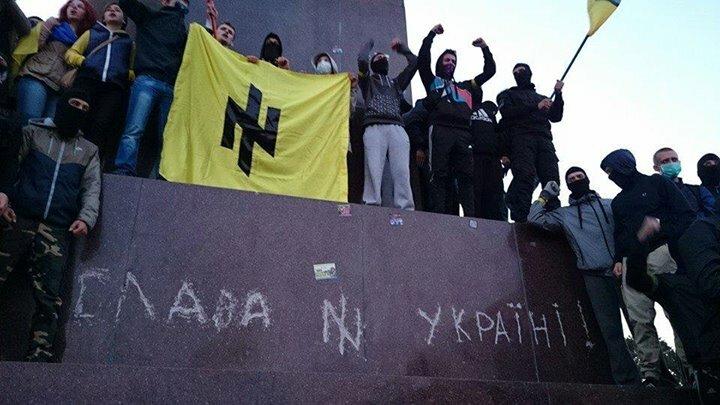 And to break up demonstrations, they are using Nazi militants. Of course, this system requires furious inflation of hysteria and extensive brainwashing in matters of history. The whole history of the territory of modern Ukraine (from the invented “proto-Ukrainians” until now) is described as the nation’s struggle for independence, leading to the necessary establishment of the current political regime. This is not just a war between civilization and barbarism. Kharkov was the first capital of Ukraine; it built planes and missiles, split the atom and created the T-34 tank, and created turbines for power plants which have been shipped around the world. Kharkov without Lenin is narrow-minded nationalism, simplistic obsession with traditional decoration, degradation of education and science. It’s not for nothing that a few of the Nazis were injured during the destruction of the monument – their level of education is not enough even to destroy an object, not to speak of building one. Of course, to say that Lenin was the founder of Ukraine would be an exaggeration, but the fact is Ukraine exists in its present borders as a result of the activities of Lenin and his political party. The Nazis’ demolition of the monument to one of the founders of the country is actually a death sentence for its further existence with the present-day borders. This entry was posted in Articles and tagged Borotba, kharkiv, Kharkov, Lenin, Sergei Kirichuk, statue. Bookmark the permalink.